The Coastal Review Online team, from left, Jared Lloyd, Kirk Ross, Catherine Kozak, Kip Tabb, Mark Hibbs, Sam Bland and Jennifer Allen, pose Thursday with the award for general excellence at the North Carolina Press Association annual editorial awards in Raleigh. 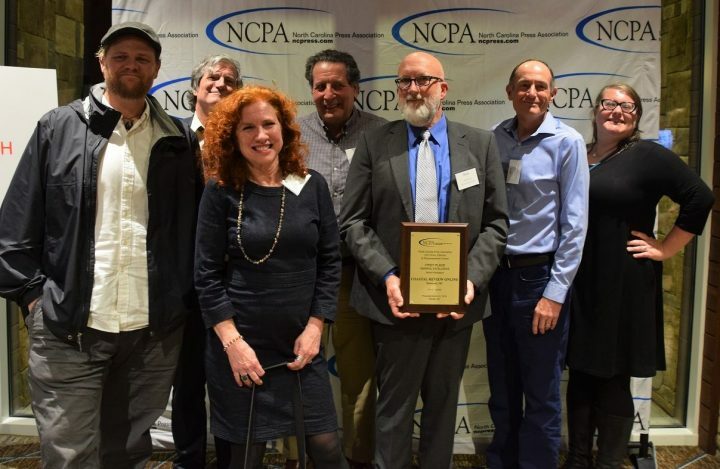 RALEIGH – Journalists, editors, freelancers and supporters from newspapers and publications across the state gathered Thursday for the annual North Carolina Press Association banquet, where Coastal Review Online won 26 awards for news coverage during 2018, including the first-place award for general excellence among online-only publications. Second place in General Excellence went to North Carolina Policy Watch and Carolina Public Press received third. The news, editorial and photojournalism contest awards ceremony is a part of the association’s annual convention held at the Raleigh Marriott Crabtree Valley. Coastal Review Online staff, reporters and photographers competed in the online-only division of the association’s annual competition. Among the awards for the nonprofit news publication’s work were eight first-place awards, including best news coverage, plus nine second-place awards and eight third-place awards. The New Jersey Press Association judged this year’s contest entries. The contest period was for work published between Oct. 1, 2017, and Sept. 30, 2018. 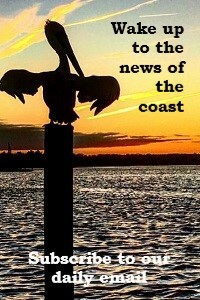 Coastal Review Online, a member of the state press association since 2013, is published Monday through Friday. 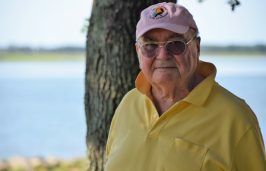 The North Carolina Coastal Federation launched the nonprofit news service in February 2012 to provide coverage of issues relevant to the people, culture, history and environment of the North Carolina coast. A member-owned and operated nonprofit group, the association was established to protect First Amendment freedoms, promote the business interests of North Carolina newspapers and maintain high standards in the industry. Members include daily and community newspapers and special interest publications; online news publications; those who provide equipment, supplies, growth opportunities and materials to the industry; and those who generally support newspaper interests. It is the only newspaper industry trade group in the state. The association’s winter convention typically includes guest speakers and education sessions for journalists, such as information on open government and laws pertaining to public records and media. The editorial contest is open to any North Carolina newspaper or online news site that is a member of the association. Coastal Review Online earned awards in a range of categories, including breaking news coverage, in-depth government reporting, feature writing, photography and columns. 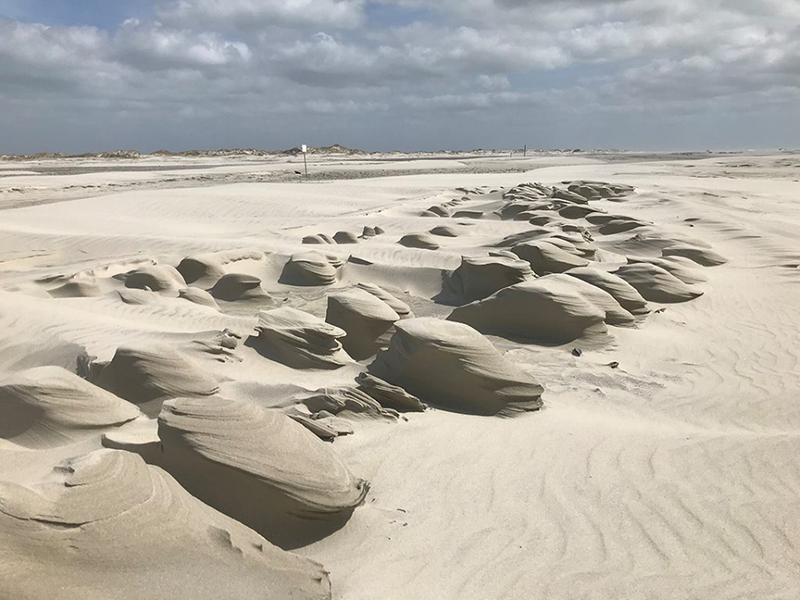 Catherine Kozak, News Enterprise Reporting, sea level rise and the North Carolina coast, multiple entries.